Many of the delightful, earthenware jars survive. We have just one small jar at Market Lavington Museum. This entry was posted on March 31, 2011 at 5:31 am and is filed under Museum. You can follow any responses to this entry through the RSS 2.0 feed. You can leave a response, or trackback from your own site. i unearthed a jar like the one in your picture today while digging in Irlam Manchester which is in very good condition..
which is similar to your picture,but larger and with a smaller neck. I think they are quite common. I have one myself which is bigger than the museum one. I found it near an old blast furnace in Shropshire. Yes, I remember having Virol too – in fact we used to get it from the “welfare” (as I remember it being called) together with orange juice concentrate just after the war. I think this was for families with small children. That isn’t something we deal in. Our museum is always willing to receive gifts which must have a real connection with the parishes of Market Lavington and Easterton. Sorry. The point I was making was that we don’t buy things so we have no idea of cash value. All our items have a connection with our villages and are therefore of value to us, beyond price. If I want to value something I usually look and see what things sell for on ebay. A virol pot like ours has less than 4 hours left in the auction as I write and has attracted no bids as yet – not even the 99p starting price. A smaller pot has a bid of £11 or so. See what they actually sell for and that gives you a guide to value. I would like some information on a Virol jar which I found in a field whilst collecting mushrooms. I know there are lots of virol jars around but the one I have is almost 30cms in height. Sorry. I know very little. I suggest you try the British Antique Bottle Forum (http://www.britishantiquebottles.co.uk/). They have been really helpful helping me -n and it isn’t just glass bottles. Virol was clearly a world wide brand. I happened across a virol jar while doing a sewer excavation in Illinois. Perfect condition! Brown glass. with F4 on the bottom. Does that mean anything? I’ve no idea if F4 means anything. Try the British Antique Bottle Forum. I have found them very helpful. Always great finding these things. It sounds as though your jar has found someone who will treasure it too. hi people im a bobcat operator and unearthed a small virol bootle the same as the museum one whilst trenching unit or flat foundations in bundaberg queensland australia in 2013 reidy. I have a professionally made photograph record of the whole Virol story, entitled, “Where Health Is Made, The Home Of Virol”. It measures 16 X 11 inches and has 22 pages of full plate photographs with the complete story of how it was made. There is an aero photograph of the factory, and a photograph of all the male staff, named. They had their own sports ground and also invited nurses to visit the factory .I have not been able to date it, but the product was made in brown bottles and 28lb tins for hospitals. One photograph shows 2 stacks of bottles with 288,000 in each. The delivery lorry also has solid tyres and VIROL on the side. How fascinating and what a lovely item to have. Was the factory in Lifton, Devon? I was given Virol by my mother in the early 60’s so it was definitely still around then…..
Gosh, how fascinating. We had no idea where the stuff was made and also didn’t know it was made so recently. I remember my mum giving us Virol in the late 50s, a spoonful every day, but I am sure it was a brown sticky substance based on a malt extract so maybe they changed the product…certainly more appealing taste than bone marrow fat! in Australia. Near an old WW2 Army Camp..it is in Worn condition.as like the picture . Virol was widely used internationally. The bottles are quite common – but still, we think, lovely items. Virol was still around in the 70’s. I gave it to my children, born in 1976 and 79, but it was thick brown, almost like treacle, made from malt. It was delicious. When babies were extra hungry or off colour we used to dissolve a spoonful in their bottles of milk! Sure that would be frowned upon nowadays! Thanks Karen – and it does say Virol now so I’ll delete your other message. Do you know I never saw it for our children (born 1977 and 1980). Mind you, in deepest rural Wiltshire we didn’t find much that was a tad out of the ordinary. We love these personal memories. It brings things alive. I was born in1949 and as a nipper we were always given a spoon of Malt Extract and concentrate Orange on a spoon. I’ve been trying to remember the brand or name of this juice.Anybody help out? I’m a similar age and remember ‘national health’ orange juice. Maybe the good old NHS did Malt extract as well? My partner has just dug up two virol jars both different sizes. Both in mint condition. Very fascinating to learn what it was used for. Staffordshire. Looks like it’s well travelled. A have a excellent example of the pot in the picture is there any value in this quality pot . What do you mean by value? As an ornament it is entirely for you to decide. Unless it has some specific historical value, then they are pretty common items. If you mean cash then we have no idea or really much interest in that. See what they fetch on an internet auction site! 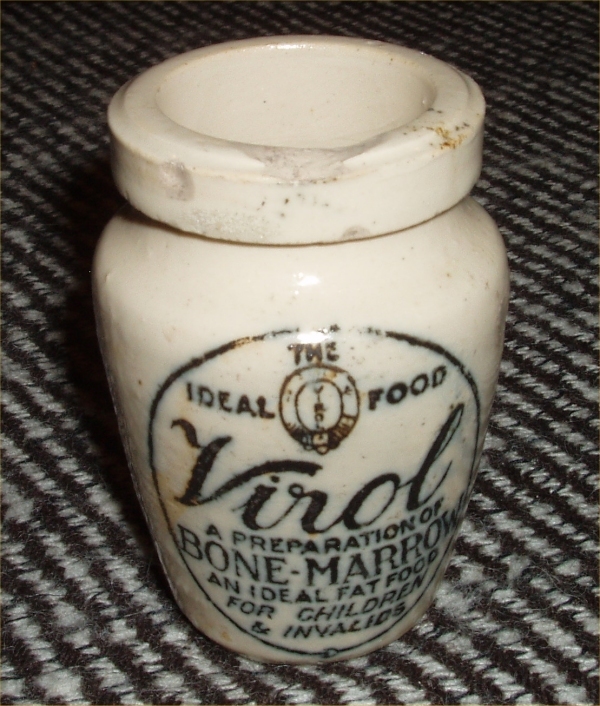 I was given a Virol jar by my aunt who was given the ” Bone-Marrow” preparation as a baby in 1909. The virol was sent to her (she lived in Alberta) from England by her grandfather. The jar is in good condition, it has a tinier neck and is made of polished earthenware. Hi Joan. We think the jars are lovely but yours also holds family history which is just fantastic. Long may you and members of your family enjoy it. In 1950, at the age of six, I was in hospital in Scotland for a couple of weeks. I recall the nurses came around the children’s wards every morning and offered us the choice of a teaspoonful of either Malt or Virol. Virol was a sweet, sticky substance, very similar to malt but somewhat darker in colour. Both the Malt and the Virol were in large glass jars with metal screw tops. I also remember orange concentrate around the same time. It was sold in a small, rectangular medicine bottle and you bought it from the local pharmacy. It had a rather bitter taste … probably with no added sugar! We found one exactly like the one shown here in great condition in our rose garden in New Zealand about 10 years ago. We were digging it up and came across all sorts of old bottles. We have kept it in our kitchen on display. I was just pesuaded by my 10 year old to look up its history on the computer after a conversation about it whilst we were sucking the marrow out of lamb shanks. I love things with a story. No, they are not rare. Being quite sturdy, they seem to have survived well.